What I like to call Warfare Welfare and Make-work Militarism. Very much on target. This is why I am for bringing back the draft. Where all able bodied youngsters would have to serve two years in the military or the equivalent nonmilitary service. Youngsters would not be able to go to college or get a job until they serve. No Draft! No Way! We had a Draft back during America’s War on Southeast Asia (Vietnam, Cambodia, and Laos) — in effect a phony proxy crusade against the Soviet Union and China. Forced Involuntary Conscription only led to greater totals of dead, maimed, and refugee poor people, both American and Southeast Asian. The Thirteenth Amendment prohibits Involuntary Servitude, and calling conscription a “Draft” does nothing to change its odious, undemocratic, and ultimately useless nature. The “able bodied” youth of America could use many things, most especially rigorous work in creative thinking, but they most assuredly do not need one additional minute of “training” in compulsory obedience to “superior” uniformed authoritarians. Solution? (1) Abolish the standing army, marine corps, and air force — along with the useless C.I.A. (“Can’t Identify Anything”) and Department of Homeland Insecurity. (2) Return to the previous system of voluntary state militias which should have no trouble fending off any Afghan goat herders or Iraqi “militants” who might manage to wade ashore at Galveston, San Diego, or Coney Island. (3) The nation does need a Navy — much reduced from its present size — but that service has always relied on voluntary enlistments and can continue to do so. (4) Institute a Corporate Wall Street War Tax to pay for it all. No more “Rich Man’s War, Poor Man’s Fight!” No Draft! No Way! If the 50 United States actually need defending, then the American people who live in those states will know of the danger and take whatever 2nd Amendment steps they think necessary to preserve their own freedoms. But first, get rid of that Standing Military Establishment that so many of our Founding Oligarchs warned us about. Sure, they had mostly their own wealth and privileges in mind when the spoke of “freedom,” but in time enough of the idea caught on to infect the rest of us with similar demands for our own independence of thought and action. Just get rid of this whole ruinous “military” thing. America doesn’t need it and most obviously cannot afford its insatiable appetites. Yes, there was a draft in Vietnam, Mike, as you know far better than I do. But it wasn’t an equitable draft. It was designed to allow the Cheneys of the USA, those with “other priorities,” to evade it with deferrals for college and marriage/children. If we ever have to revive a draft (invasion USA? ), it must have no exemptions except for physical or mental disabilities. If anything, the sons and daughters of the upper crust must be at the top of the list, along with all members of professional sports teams (they’re physically fit and they support our troops, or so they say), and all elite students at top-flight colleges (The Ivies, MIT, CalTech, UC-Berkeley, and so on). Members of the working classes, already over-represented in the AVM, should be drafted LAST. Let’s see how quickly the elites embrace a draft like that! Why don’t we just call both the army and the private corporate warriors by the accepted term “mercenarys” for those who join a military for money? In WWII a private was fed and clothed and dedicated his or her life for $20 per month ($240 per year). Today a private is paid something over $20,000 per year. I prefer the terms “Vaunted Visigoths,” “Professional Praetorians,” “Dogs-of-War Mercenaries,” and “Corporate Camp Followers.” As Confucius said: the first order of business involves “rectifying the names,” because if we do not call things by their proper descriptive terminology, then we have no hope of forming an effective government in the first place. And as George Orwell said, never use the standard, received words for things — since these exist by design only to deceive the populace — but, instead, invent and consistently utilize a nomenclature that reveals the true nature of the beast and its insatiable appetites. I promise to do my part. “Corporate Camp Followers” is excellent. you are quite right sir. the problem with a “volunteer” and “professional” military is that it is too easy to use. the country’s political class has no skin in the game – it’s not their sons & daughters going in harms way – so hey, lets go bomb some more countries. for the most part the public doesn’t really care, and they honestly feel they have no “say” in when to go to war, so they just tune it out. the “false patriotism” also grinds me – all the guys with flags on their trucks, would never volunteer! bringing back the draft – which will never happen – would help. can you imagine invading Iraq if we had had the draft?? I am influenced by arguments against a draft/mandatory military service, when I wasn’t as recently as two decades ago. The reason my position is changing (besides reasons others contribute on this page) is plutocrats pay a relatively minuscule amount for Presidential force deployment authorization; another somewhat larger amount to maintain a Congress which will barely if at all demure — and most certainly not defy them; accept as their just due the socialized Defense Department expense burden tax receipts pay for; also accept as just due profits which result from these activities (munitions/arms/equipment purchases, fuel/lubricants, contracts for services & security personnel no longer available in the modern, “leaner” AVM (at one hell of a per person markup, in many cases); and, well, I could go on, but you get the picture. I still have not abandoned the notion that a one or two year national service obligation of some sort, required to be fulfilled by all citizens at some point between high school and maybe age 25, might result in improved citizenship over time. The very wealthy would evade this, of course. But I’ve always been a dreamer. One longtime wish is for every CongressCritter and Oval Office occupant to spend two weeks per year living smack dab in the middle of the most poverty-stricken portion of their district (the Pres could be plopped down in 13 different places, one night each, every year in office, and get an even better break 2 of his 4 years, only going out for 12 days total — bonus! A perk for being top dog). Did I say I am a dreamer? Hell, I must be on drugs. — 13%, it is not just a US problem! AND hammers don’t drive nails … the human element is the issue. Some have issues with ‘drones’ (http://www.csmonitor.com/USA/Military/2015/0617/The-ethics-of-killer-robots) taking the ‘decision’ away from humans, BUT humans write the code that generates the decisions. People, singly AND collectively are responsible for the use of their tools! Only one good thing ever came of America’s colossal crime against the American working class and people of Southeast Asia (Vietnam, Cambodia, and Laos): namely, the Twenty-sixth Amendment to the U.S. Constitution granting 18-year-old citizens the right to vote. Back in the days of my youth when I feared and loathed the Draft, I would often have a disagreement with my World-War-II generation mother. She would ask: “But who will protect us from our enemies if you don’t?” To which I would reply (since I couldn’t vote but she could): “Who will protect me from my own government if you don’t?” Even as a young, know-nothing high school student, I could see that I had no enemies among the peoples of Southeast Asia (whom my mother probably mistook for the Imperial Japanese of her experience), but that I did have some real, nasty enemies much closer to home in the government of my own country. Today’s American youth — and today’s impoverished foreign peasants — have the same lying enemies in the same self-serving places in the same lying U.S. government. Any mention of a Draft — another word for Involuntary Servitude, or Slavery — should automatically engender a deep feeling of revulsion and rebellion in all young, voting-age American citizen. The ruling oligarchical collective understands that American youth do not normally vote in significant numbers, but if threatened with a resumption of a Draft — no matter how smarmy and duplicitous the propaganda advanced to conceal its true nature — an entire generation of voters would come into existence dedicated to nothing less than the repudiation of their own government. No American government seems foolish enough to risk this generational repudiation. So, we still have the same needless, pointless, ruinous wars-just-to-have-war somewhere, someplace, against someone. Nevertheless, thanks to the Twenty-sixth Amendment, few young Americans want anything to do with such a stupid waste of life and treasure. Good for them. My generation may not have put an end to stupid imperial wars for vainglorious power and obscene corporate profits, but we did purchase with our own servitude the choice that this and later generations of young Americans have regarding their own lives and freedoms. No Americans have “betrayed” our military by not agreeing to serve in it. Quite to the contrary, when no one at all serves in these disastrous criminal enterprises, the world will fare much better for the absence of uniformed and browbeaten slaves. The Chinese had it right when they said: “You don’t use good iron to make a nail, and you don’t use good men to make a soldier.” The American people could learn a lot from the Chinese. Truly passionate writing. Certainly, the U.S. military should have largely demobilized after the collapse of the Soviet Union in the early 1990s. That it didn’t was a colossal blunder for the health of our nation. I return to a point I made earlier — we didn’t just contain the Soviets, they contained us. Once we “won,” hubris struck. We’ve been guilty of imperial overstretch ever since. I’m not sure how to stop this except by starving the military-industrial-Congressional complex of money, but it’s probably too late for that. The MIC complex has redefined the entire ethos of the country, making it militaristic in many cases, and most certainly aggressive and pro-war in the sense of always being with the troops no matter how they’re misused and abused by the elites. So any cuts, even sane ones, are instantly portrayed as “betraying” our heroes in the field, of weakening “the finest military ever.” And so the debate ends before it even begins. While young Americans today are free of the draft, they are also free of any political force to change America’s course, i.e. they are simply not motivated to act, or they’re too disenchanted to act. Occupy Wall Street was a momentary blip that was easily contained by elites, its energy and anger defused. Young people, in a way, face a new form of servitude — not the draft, but enormous student debt, combined with limited job opportunities. Higher debts and lower prospects are working to keep the young largely subservient and supine. The anger of the 1960s — the energy that made change possible — seems completely absent today. Good observation of “a new form of servitude” – $17T in recognized national debt and multiples of that unbooked and unrecognized. 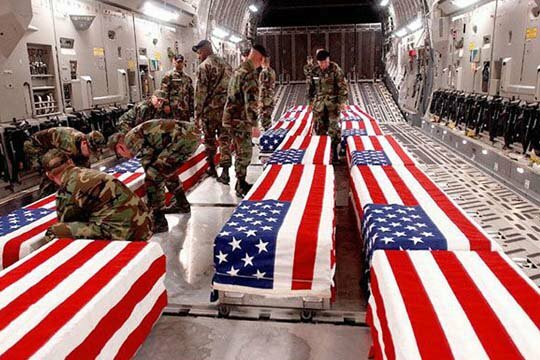 Since the end of the draft the blood and treasure costs of our wars are much the same: unbooked and unrecognized. Figuratively speaking, when Richard Nixon and Jane Fonda combined forces to end the draft, they became birth-parents of the war in Iraq (and all that followed). Get ready for more. As a practical matter, a draft that produces soldiers that serve for only two years is more trouble than it’s worth. In the 1940s, 50s, and most of the 60s, military inductees were given minimal training in relatively simple weapons and basic combat skills. Training typically lasted a few weeks for most and then they were sent into the field. The results were soldiers and, subsequently units, that were poorly prepared for combat, and high casualty rates among soldiers during their initial weeks in combat. Today’s weapons are more complex and require more training. Operational threats and asymmetric warfare are more dangerous and complicated. Individual and small unit and combined unit combat skills are recognized as critical to operational success and effectiveness. The result of all this is recognition that the modern soldier requires much more and much longer training before being sent into combat. Unless you want to send poorly trained people and units into combat and accept high casualty rates, then you will need to invest most of a two-year service obligation in costly training; there will be little time left to put the soldiers to work. And, obviously, in the support specialties, where weapon system, logistics, intelligence and other technical skill training is required, you will spend all the service time in training. The training time and cost of a two-year draft would overwhelm any operational gains.